Camp Scandinavia | Camp Scandinavia - Support For Better Life! Our vision is that Camp Scandinavia will be an innovative family-owned company, internationally recognized through its own products in orthotics. The Nordic domestic market, the orthopedic technology forms the basis of our business. Creativity and knowledge will strengthen its market position. 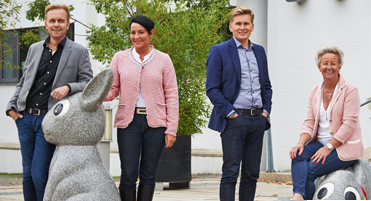 With Danish Sales Manager, Swedish Distribution Manager and Marketing Manager and a Norwegian Managing Director Camp Scandinavia now have a Scandinavian management team. Does this have any significance to you as a customer? No, maybe not in the starting point, but when we see that all our Nordic countries are represented in our product and that we collaborate with specialists in all the Nordic countries, we mean that we really show that we are investing in our Nordic home market. In addition, our product specialists are medically trained and we have local customer support in each country. By having local warehouses in Sweden, Norway and Finland so we can ensure that orders that arrives before 14.00 am will be with you the day after - whether it's Denmark, Sweden, Norway or Finland. In 2014, we introduced many new products that we know make a difference for the user. For us it was a great pleasure to launch the update of our core product - ToeOFF®. This upgrade was based on the wishes and views we received from the market. In the future, we will launch many new products, further developments and improvements. The common denominator of these is that they are often based on input and feedback from our customers. You wish, we listen!